The SecuTablet is based on the Tab S 10.5, pictured on the left. Hours before CeBIT is due to start in Hannover, Germany, BlackBerry's Secusmart has launched a new tablet called SecuTablet, in partnership with IBM and Samsung. However, it is not the iconic tablet, the spiritual son of the PlayBook, that BlackBerry's CEO John Chen, hinted at MWC a couple of weeks ago. 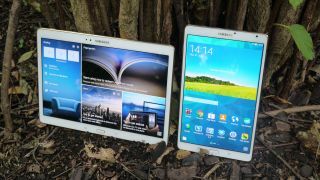 Turns out that it is a tablet based on the Samsung Galaxy Tab S 10.5, probably one of the best tablets on the market, at least when it comes to its specs. The new device targets the lucrative global security market where national and international public sector entities and enterprises looking for enhanced data protection. IBM will provide with the secure app wrapping technology for the SecuTablet and support to implement it in various public sector bodies. Secusmart will provide with the underlying security features and handle the branding. Other than that there are no details about its price, availability and whether the Android OS that powers it has been modified or not. Users will still be able to install their own applications and popular apps such as Twitter, Youtube, Facebook or Whatsapp (BlackBerry's press release mentions "additional security" for some apps). Will it make it to our list of top business tablets?